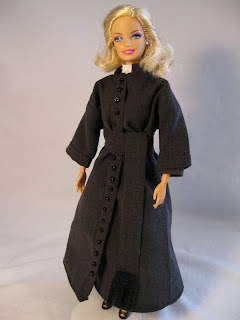 Will Barbie Save The Episcopal Church? This essay from Walter Russell Mead is well worth reading. On the other hand, we did successfully vet the lyrics of the 700-plus hymns in our hymnbook for ’sexist’ lyrics. We have repeatedly made certain that the world understands that we think that poverty, injustice and war are wrong. There is no fashionable virtue that we don’t praise, no unrealistic aspiration of the foundation left that we don’t sprinkle with holy water. Our procedures and our canons are among the most complex and recondite in Christendom. We tithe mint and dill and cumin while the house is burning down. I hate to say this, guys, but I think God mocks us and holds us in derision. I think the disasters we have already experienced and the much greater ones that are coming closer every day are signs of his wrath. I think he is giving us the taste of wormwood and gall: he’s letting us face the full consequences of our own silly deeds. He waited patiently for decades as we frittered away the inestimable riches and advantages accrued over centuries. He bore our hypocrisy — incompetent busybodies and Mrs. Jellybys lecturing the rest of the world on how to manage its affairs as our own household fell progressively into deeper disarray — and our general inconsequential messing around with low priority issues like ’sexist’ hymn lyrics as our seminaries edged steadily closer to bankruptcy. But we’ve exhausted God’s patience and spent down our endowments. The Bailiff of Heaven is knocking at our door; the notice of eviction is in his hands.